This is not our front yard. This is my son’s classmate’s front yard. Does it not look pretty? How I wish that we have a front yard like this. I love the pathway. We have a pathway too but it needs repair. I hope that next year, our pathway will get fix. I like the flowers on their front yard too. I know I need to plant more flowers on our front yard. The problem with big property is? You have to make sure that you have enough budgets for each project you want. How I wish that I will win a makeover about the front yard. Would you want to win to a yard makes over too? This entry was posted in landscape, outdoor, yard and tagged make over. Bookmark the permalink. 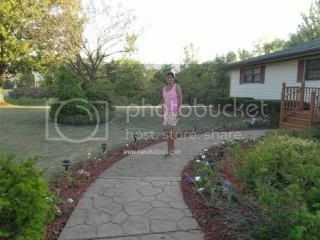 I like their frontyard too mamijess…nahan ko sa ila walkway…pero mas ganahan ko sa imo kay daghan kau ug buwak…ehehhee! It does looks nice, the paved pathway makes it look like a garden in the park doesn’t it? i love their walkway. We do have a walkway at home but less plants. Maybe someday I will have the budget to improve it. Wheeee beautiful front yard! I want to win a front and backyard make over saan ba nay promo? oo bitaw nice, sige lang momi jess make-over will come soon… have a nice day! Nice lanscaping and i like the way the brick lined up! You can have it mommy do not worry hehe. Nindot bitaw no? Looks like your son’s classmate front yard is very well taken care of. I have a pathway too and like you’ve said, ours is not done that neatly as well. I wish I have more patience. I have the ability but luck of time and patience,that’s all.